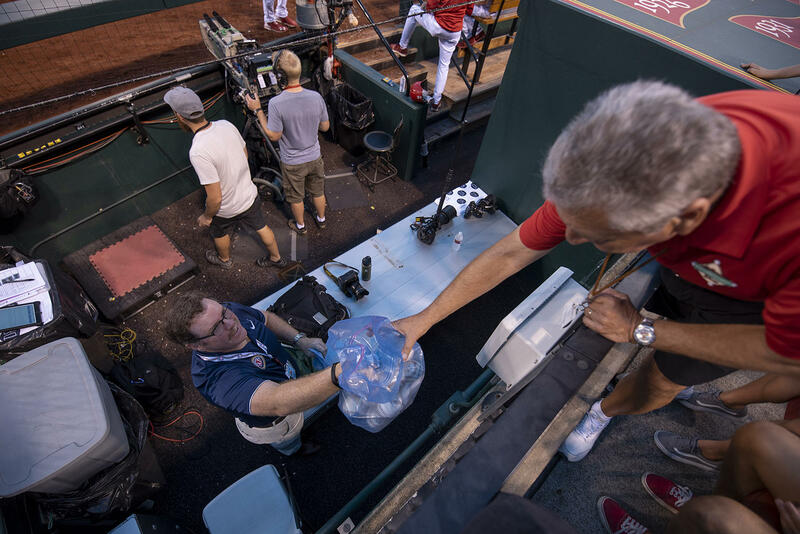 Ralph Toenjes carries game-used baseballs from the Cardinals dugout to the Authentics Shop at Busch Stadium during an Aug. 16 game. 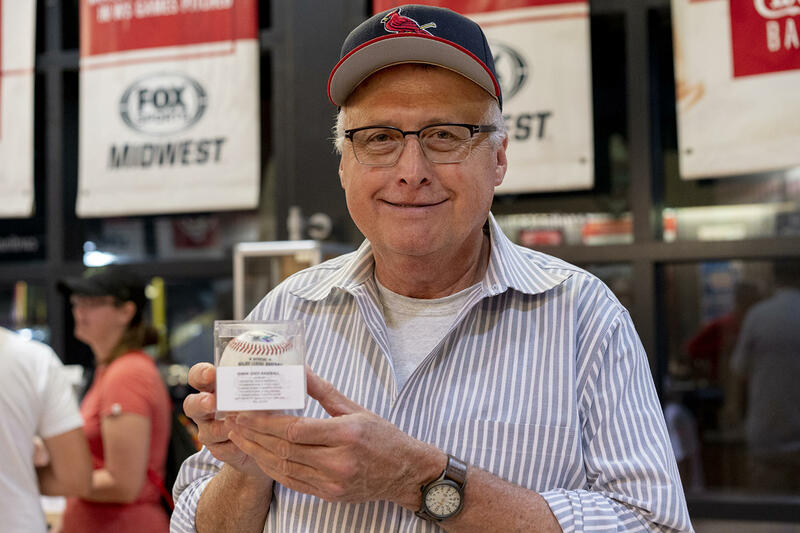 Listen to Ralph Toenjes talk about collecting game-used baseballs at Busch Stadium. The playing career of a baseball is brief. A fair share end up in the stands. Umpires discard dozens of others after they’ve been dinged by a bat or bounced in the dirt. The Cardinals prepare 120 baseballs for every game. On an average game day, between 40 and 60 used baseballs will end up in the Authentics Shop. With the fourth inning under way, Toenjes grabbed a tired-looking blue plastic sack from behind the counter and headed off to transport baseball history. Toenjes, 71, a former St. Louis police officer, has worked at the stadium since retiring from the department 11 years ago. He enjoys making the rounds between center field and home plate, weaving through fans and beer vendors and ducking under poles of cotton candy. Related: "St. Louis on the Air" host Don Marsh talks to St. Louis Public Radio reporter Mary Delach Leonard about what happens to used baseballs at Busch Stadium. In section 145, Toenjes paused next to the television crew filming the game from behind home plate. The Cards were down 4 - 1. Nationals pitcher Tanner Roark was on the mound, and Cardinals outfielder Marcell Ozuna was at the plate. Toenjes kept his eye on that baseball, as Ozuna smacked it into left field. Washington Nationals pitcher Tanner Roark pitches to Cardinals infielder Paul DeJong in the bottom of the 4th inning on Aug. 16. DeJong would line out to center field. To his surprise, the ball was returned to Roark who held onto it instead of casting it off. He pitched it to the Cards' Paul DeJong, who lined out to Nationals All-Star Bryce Harper. 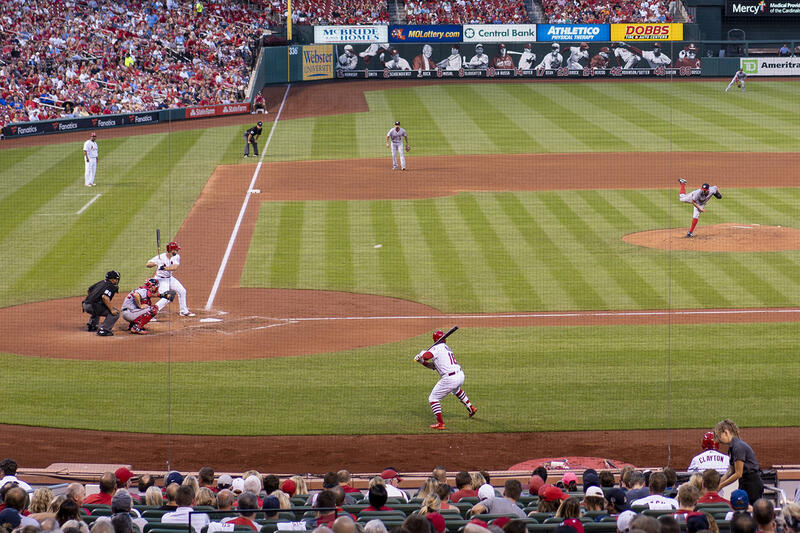 Still, the ball stayed in the game — until, finally, it landed in the dirt after a pitch to Kolten Wong. “We’re going to get that ball. 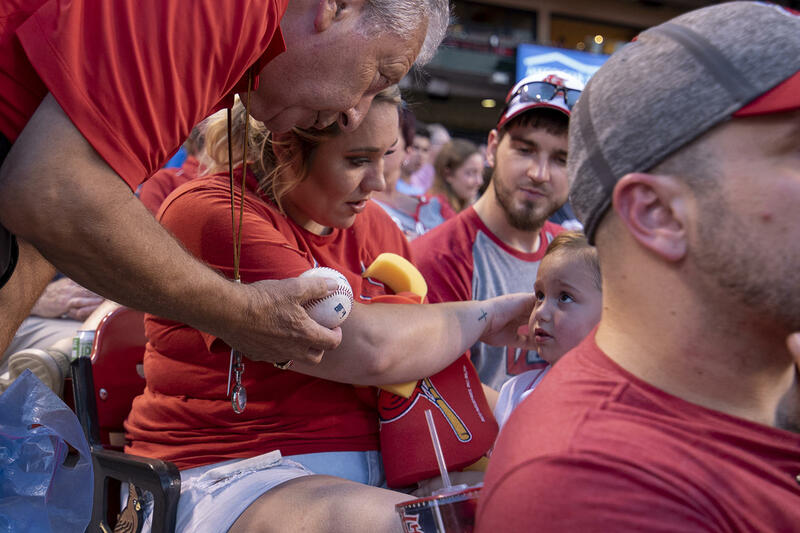 It’s a good one,” Toenjes said, as the umpire handed it to the bat boy who delivered it to Steve Hampton, an authenticator who sat in a camera well next to the Cardinals dugout, keeping track of every ball used in the game. Authenticators are on duty during every game to guarantee that memorabilia is authentic. They are off-duty law enforcement officers hired by a third-party contractor, approved by Major League Baseball. Steve Hampton (at left), an off-duty law enforcement officer, is a baseball authenticator. He tracks what happens to baseballs used in a game. Here, he hands a bag of used game balls to Ralph Toenjes to take to the Authentics Shop. As the inning ended, Toenjes trotted down the steps and leaned over the rail next to the dugout. He said a quick hello to Hampton, who handed him the sack of balls he’d collected through the fourth inning. As Toenjes headed back to the shop, fans frequently stopped him. “Who doesn’t want a baseball?’’ he said, smiling. Ralph Toenjes (at left) often gets to work early so he can nab batting practice balls hit into the stands and give them away to fans, especially kids, during the game. “Who doesn’t want a baseball?’’ he said smiling. By the time Toenjes returned to the shop, retail operations manager Ashley Brown had printed out stickers for each baseball. The process begins the moment the authenticator slaps a tamper-proof MLB hologram onto a ball and enters the serial number into a software program, she said. The number is linked to the MLB’s Gameday app that tracks every pitch. 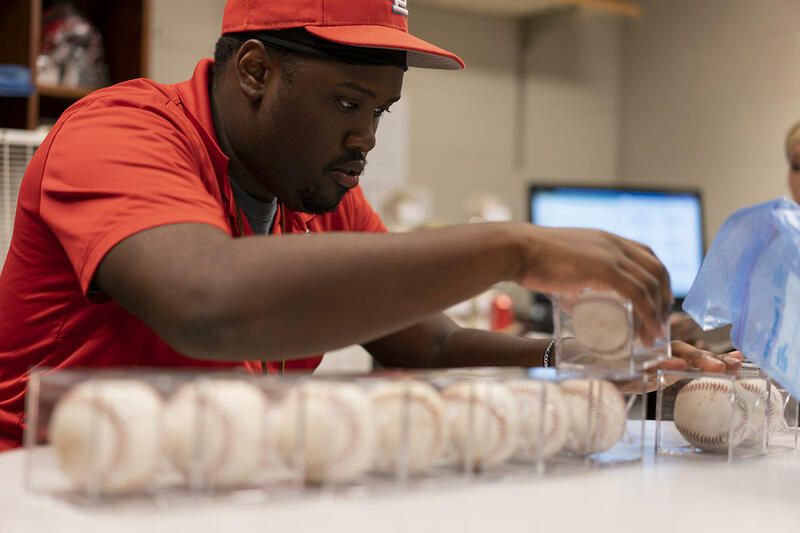 Kenneth Harris works in the Authentics Shop and helps package the baseballs for sale on Aug. 16. Within minutes, Brown’s crew packaged the baseballs into clear plastic cases and attached stickers summarizing their game histories. Fans often wait in the shop for the game balls to arrive, Brown said. Some are looking for a specific baseball they watched during a play. The Authentics Shop at Busch Stadium displays authenticated game balls for sale. 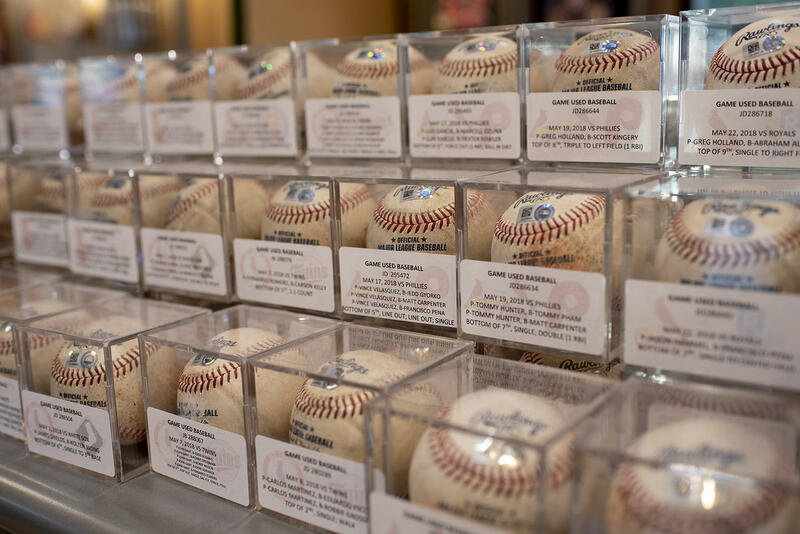 The prices of baseballs used in a game are driven by the memorabilia market and are frequently adjusted, she said. Prices for a game-used ball start at $40. But a ball that Cards catcher Yadier Molina hits for a single, currently sells for $125; add $15 for each run batted in on the play. By comparison, rookie center fielder Harrison Bader’s singles are currently priced at $85. Among the 17 baseballs in the first batch delivered by Toenjes was JD290180, the ball he watched intently on the field because it was used in so many plays. He pointed it out to Scot Macomber, a Red Sox fan from New Jersey, who came into the shop looking for a baseball from that night’s game. Macomber paid $55 for the ball and joked that it will rest well in his collection in New Jersey. Scot Macomber poses for a portrait Aug. 16 with JD290180, the ball we followed during the game and that he bought from the Authentics Shop.